Note: image is not part of the Calypso St. Barth x Target collection but is from the current signature collection. 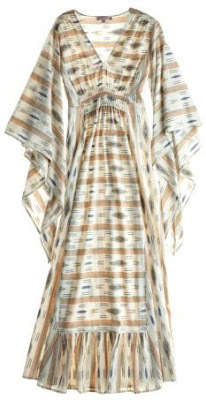 Luxe lifestyle brand Calypso St. Barth has been tapped as the next Target collaboration according to InStyle.com. According to Trish Adams, Target’s SVP of merchandising, “Calypso St. Barth is a renowned global brand with an incredibly loyal following and we think Target’s guests will love the no-fuss, sophisticated appeal of the collection”. Calypso St. Barth is a celeb favorite and since 1992 they have made bohemian design inspired by worldwide destinations like Rajasthan, Marrakech and Bali accessible to women around the world. Expect to see plenty of beaded caftans, vibrant tunics and colorful silk dresses. The collection will include not only womenswear and childrenswear but a home collection, including candles, pillows and glassware. The collection is set to hit Target stores and be available online on May 1, 2011 and will retail for $1.99 to $79.99. Wow! Great post I have never heard of Calypso St. Barth before. I really like the color and style of the print on that clothing piece! That's exciting, I hope they feature some great pieces! Can't wait to see it - I love the dress in the picture!